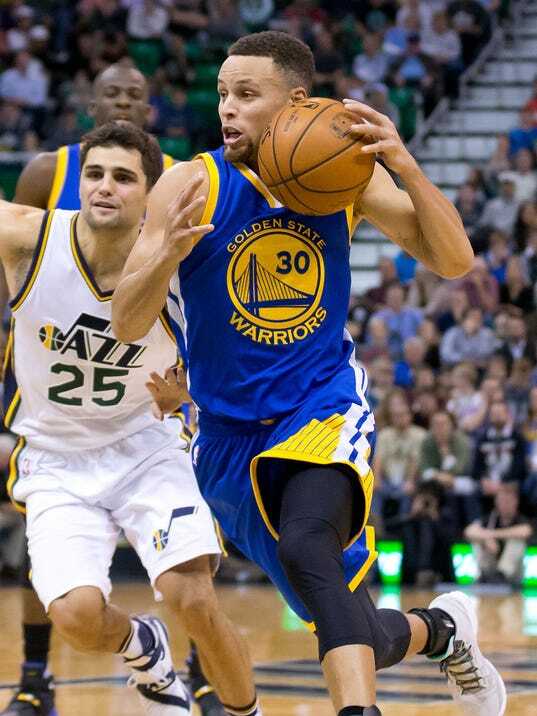 SALT LAKE CITY (AP) — Stephen Curry scored 26 points and the Golden State Warriors held on for their NBA-record 19th consecutive win to start the season after a 106-103 victory over the Utah Jazz on Monday night. With the game tied at 101 with 51 seconds left, Curry hit a 3-pointer from the left wing to give the Warriors the lead. Rodney Hood scored 14 seconds later to bring the Jazz within one. After Curry missed a 3-pointer, the Jazz had a chance to take the lead, but Hood missed a 3 from the wing with five seconds left. Curry hit two free throws to seal the victory as Gordon Hayward’s half-courter at the buzzer fell way short. Klay Thompson added 20, including four 3-point baskets. Hayward led the Jazz with 24 points. The Warriors have won 23 straight regular-season games dating back to last season. The two teams went back and forth down the stretch hitting shots in the fourth quarter. Alec Burks scored six straight and Favors gave the Jazz a 99-97 lead on a three-point play. Then Curry hit another 3-pointer.